Hey folks! This weekend flew by! We didn’t realize it was over until we woke up Monday morning. We are looking forward to the extra days off and plan on ending the week with pies and booze, we mean Turkey! Of course, we still have stuff to do but maybe we can sleep in just a bit to help catch up. Last Sunday morning we got up and on the road before 7am to get to JT. It’s been busy around here! Our main objective for going out to the house was to get the final dimensions for the kitchen and bath cabinets. The cabinet maker is going to start on them this week and we should be able to bring them to the house the first week of December. With Paul’s parents coming at the end of the month we want to make sure we have as much, if not everything, finished. Our goal is to stay for a week in the desert at the end of the year, but of course that means we need to have finished interiors. The kitchen cabinets are modern mixed with traditional shaker doors and the bathroom, if you remember the post from awhile back, will have more modern cabinets. We have had a great time working on our house and for the most part we agree on just about everything. Until we got to appliances….. Paul wants to use something inexpensive because it is a rental, but cheap appliances kind of look….cheap! Becky wants something that looks great from all angles because the space is so open, but the good looking appliances come with not so good looking price tags. Finding something that fits in the budget and is still semi-attractive is hard to do. Paul agreed that whenever we design the kitchen in our dream home that he won’t be as worried about the appliance budget…. Time will tell if that’s true << That was Becky speaking. 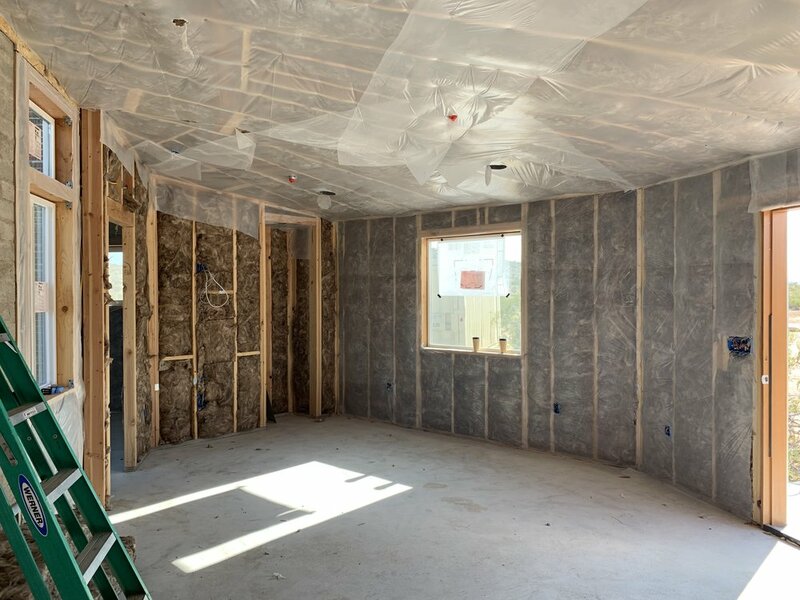 When we got to the jobsite on Sunday morning we were pleasantly surprised to see almost all of the insulation installed. This is typically when the house “shrinks”. Thankfully it was just as we imagined and it still feels spacious. They have a little more insulation to do this week but drywall will be starting the beginning of next week!! Yay!!!! We’re at the fun stage where every trip is a major change. This year our Thanksgiving plans have changed and for the first time we will be cooking the whole meal ourselves. Wish us luck! Happy Thanksgiving from our little family to yours.